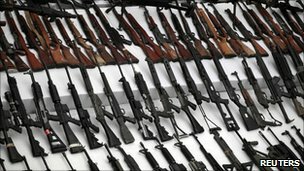 A US Congressional report suggests some 70% of firearms recovered from Mexican crime scenes in 2009 and 2010 and submitted for tracing came from the US. The report indicates Mexican drug cartels are arming themselves with US military-style weapons. The senators who compiled the report urge a strengthening of US regulations to stem the flow of guns to Mexico. Mexican President Felipe Calderon has repeatedly called for the US to implement stricter firearms laws. The report, Halting US Firearms Trafficking to Mexico, by Democratic Senators Dianne Feinstein (California), Charles Schumer (New York) and Sheldon Whitehouse (Rhode Island) says US guns have contributed to "Mexico's dangerous levels of violence". It quotes Acting Director of the Bureau of Alcohol, Tobacco, Firearms and Explosives (ATF) Kenneth Melson stating that of the 29,284 firearms recovered in Mexico in 2009 and 2010 and submitted for tracing, 20,504 came from the United States. The senators accuse the US Congress of having been "virtually moribund" while Mexican drug gangs snap up US military-style guns. Their report comes a day after President Calderon accused the US arms industry of causing thousands of deaths in Mexico. "Why does this arms business continue?" he asked. "I say it openly: it's because of the profit which the US arms industry makes," he added.